The Vote SUMP! project idea (posted 9/19/05) is well underway. I've made some modifications, most notably, to the character's face. I've also changed the VOTE SUMP! concept to SUPPORT SUMP! Obviously no one will be able to vote for sump. So support sump made more sense. The above images are a couple T-shirt designs. I wish I could create my own shirts and leave them around town for people to find. Obviously too costly and time consuming. So I set up a cafepress store instead. I'll post the link when it's up and running. (I'll also be offering bumper stickers and other assorted "campaign" items). I wish I could just provide those items at my own expense. Obviously that's not realistic. 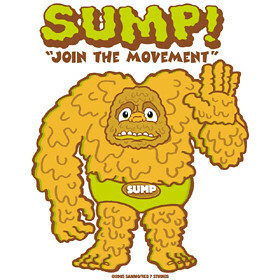 I'm thinking about running a couple anonymous ads in our local paper depicting SUMP but with no explanation. The ads are really cheap. Some as low as $10.00 (business card size ad)... the only problem is the ad people at the local paper ask too many questions. Time will tell with that one. a www.supportsump.com micro web site may become a reality. The design studio I work for has agreed to buy the domain name, host the site and provide coding support. 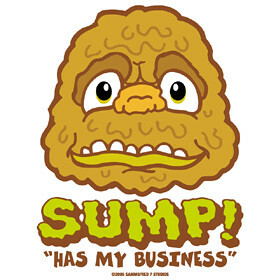 It's highly likely there'll be a mini-game with SUMP running around catching sewage in a bucket. I'm glad the idea hit me during September and not October. It'd be NO fun trying to roll out an ambitious project like this in a couple weeks. At least now I can plan out everything for maximum impact. Worse case scenario I can always resort back to leaving yard signs around town (which I'm still going to do).